The only thing I did, was I added "Emboss", and brought the lever down to left hand corner !! LadyArtist wrote: Thanks Lugi ! You are very welcome LadyArtist !! No you do not have strange tastes, it is very good art, very good indeed. I went into town today as it was raining for a change. I do like painting umbrellas and this one of yours is great, thanks for all the hard work Lugi with the AOP's, cheers. 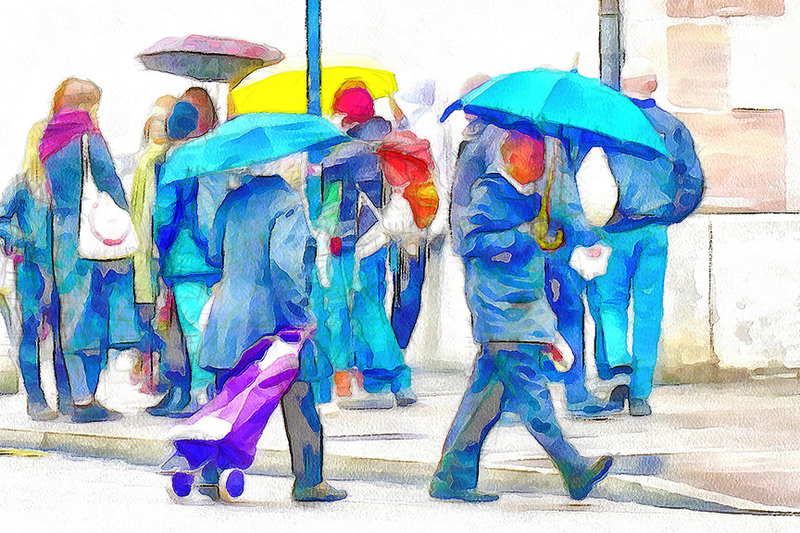 Here is a painting of my umbrellas from one of the photos from this morning whilst shopping for my brunch. I used one of Lugi's great AOP's called LugiWaterColor then I used the original photo with AKVIS Sketch and merged the 2 results in Photoshop. I adjusted the opacity of the AKVIS Sketch to about 80% then I used a mask on the layer to lighten some of the crosshatching. Let me know what you think. I like constructive criticism and like the truth, it's the only way to learn. Cheers and thanks again for all of the AOP's. Don't forget to use your " Retouch soft reveal brush at different settings"
LadyArtist wrote: thanks Lugi !! You are very welcome LadyArtist, and Peter-GZ !! Ozzy wrote: Here is a painting of my umbrellas from one of the photos from this morning whilst shopping for my brunch. It turned out nice !